Among the many other things added to the PUBG test servers last night was a new Snowbike vehicle, allowing players to zip around the frosty Vikendi map a little more freely and in a style befitting the map. Alas, it was a short-lived affair, with the developers pulling the Snowbike from the test environment a little earlier on today. PC Players: Due to critical issues negatively impacting gameplay, we've made the difficult decision of removing the Snowbike from Update #25. The Snowbike won't be added to live servers until these issues are resolved. We apologize for any disappointment caused. As the developers have said in the same tweet, the Snowbike won't be making an appearance in the live game until the issues have been resolved. If the problem was serious enough for it to be pulled from even the test environment though, it sounds as though we'll be waiting a while for the vehicle to make it's way into the live game. Despite the disappointing removal of this particular update element though, there's still plenty of fun new stuff to mess around with on the test servers. A new weapon - the Bizon - is currently in testing, and is a SMG that's exclusive to the Vikendi and Erangel maps. Additionally, a new attachment - the Canted Sight - allows you to switch between aiming views. 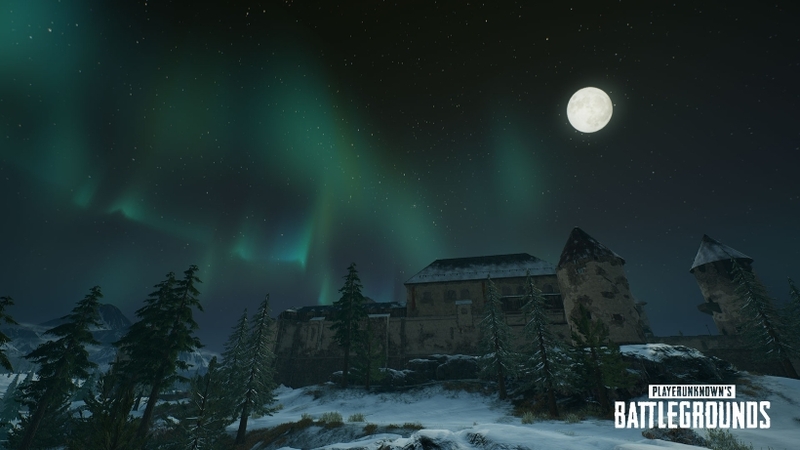 As for sprucing up the gameworld, a new moonlit weather setting has been applied to Vikendi, and sets off the crisp winter environment nicely with a very impressive recreation of the Northern Lights. Have a look at the screenshot a little further up the page to see how it looks. Finally, there's the usual collection of balance tweaks and bug fixes. You can find out more by reading the Test Server patch notes hosted on the official PUBG site.